European sacred architecture, like in Indian and other civilizations, employed a lot of symbolism to reflect the structure of the cosmos. Initially, sacred monuments were associated with a particular god or goddess, and were aligned by or with the stars or planets which represented the god or goddess. 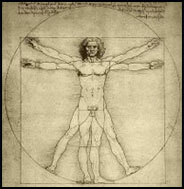 Mathematical mysticism or sacred geometry was a profound part of European sacred architecture. Pythagoras authored a humanistic philosophy which utilized mathematical harmony and proportion as a tool to describe art, architecture, music and history. The Canon was the ancient esoteric systems of measurement whose measuring scales came from an integration of planetary movements and human proportions. The “golden means” is a proportion of 1:1.618,denoted by the Greek letter phi (F or f), that was used in the design and construction of ancient Egyptian and Greek temples and is also referred to as the “divine proportion”. In modern times, Le Corbusier was one of its most prominent practitioners. In the 1960s, a group of doctors in Germany found that different people living in certain building over a period of several decades, developed similar health problems. So was it the house - its location, shape, material and orientation - which caused the same health problems to the occupants? The quest for an answer to this question gave birth to the new science of Geobiology, which studies the effects of Bio-Electro-Magnetic radiations emitted by various sources, including the earth, the sun and moon and the environment. Our Geobiology research has unfolded the secrets of Bio-Electro-Magnetic radiations in Buildings, of the human energy axes and their characteristics. In the late 1970s, German physician Dr Ernst Hartmann developed an instrument, the Lobe An­tenna, and discovered grids of energy lines emanating from the earth‘s surface and circumscribing the globe. These grid lines are oriented in the north-south direc­tion at 2m intervals, and in the east-west direction at 2.5m intervals, and are now called the Hartmann Grid. The resulting energy field is termed “telluric” Bio-Elec­tro-Magnetic (BEM) energy. The alignment of buildings, materials and even the body with respect to these energies has a distinct affect on the well-being of man. That the existence of these energy grid lines was known in ancient times is revealed by various structures from different civilisations. The old monasteries in the Himalayan region orient the houses and cells for monks such that they are contained within the BEM grids in what is normally a neutral zone. The 4,000-year-old Menhirs, the megaliths dotting the surface of the earth from the Far East to Ireland, were located specifically on the most negative energy nodes (intersections of BEM grids) so that their position, material and form together transformed the negative telluric vibrational grids into positive fields. They act like transmitters, radiating and affecting a vast area, a function they perform to this day. Similarly, Dolmens act as receivers. The Romans oriented all the buildings in their villages, towns and cities with respect to the cardinal BEM grids. All their roads of conquest followed large BEM grids, having energy lines (called Maximus Maximo­rum) at distances of 2 to 3 km. The Romans manipulated the grids to render them positive, thereby reducing fatigue amongst their marching soldiers and charioteers as they walked their roads of conquest. Prof. Lugovenko of the Moscow Academy of Sciences has been doing fascinating research in this area and he poetically calls it, "The Breadth of the Earth“. Further research revealed the interesting fact that the Earth‘s magnetic field is not a blanket, but a maze of grids which are complex, but which have definite pat­terns. 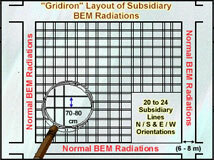 BEM grids are of four types - Major, Principal, Normal and Subsidiary. While the first three emanate grid lines perpendicular to the earth‘s surface, the Subsidiary lines are at varying angles, whose dimensions vary ac­cording to the geography of locations. The Major and Principal Grids can sometimes be kil­ometers apart, while the Normal Grids are found to be separated by smaller distances. While the Major Grid Lines have a width of 50m to 60m, the Principal Grid Lines have a width of 40m to 50m, and the Normal Lines have a width of 6m to 8m. The Major and Principal Grid Lines contain sub-lines of radiation within them, which again emanate perpen­dicular to the earth‘s surface. The Subsidiary Lines which reside within the larger grids, are normally in groups of 26 pairs. Curiously, the subsidiary lines are split midway be­tween the larger grids, with 13 pairs tilted one way, and the rest tilted the other way. The exact angle of their radiation from the earth‘s surface can be measured us­ing the Lecher Antenna. Perhaps it is this understanding of BEM grids that forms the basis for designing in the ancient Vaastu texts.